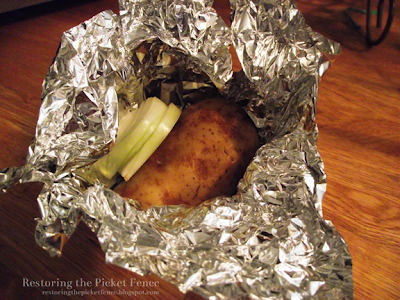 Grandpa always used to say, "You only have to pray before meals that have potatoes." So when you come from a Dutch family, that means you will be praying before eating 99% of your meals. A couple times a month, J and I have soup and baked potato night. It's a simple dinner that we can have after a long day of working/commuting/parenting. Step one: Wrap clean potatoes in foil. No need to stab, slice or poke. You can rub them in olive oil, add some salt, whatever you fancy. 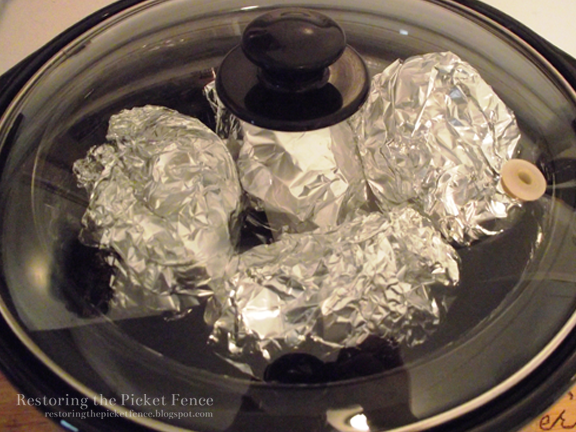 Since I put the potatoes in the foil immediately after washing, the water seems to steam them well enough without the oil. 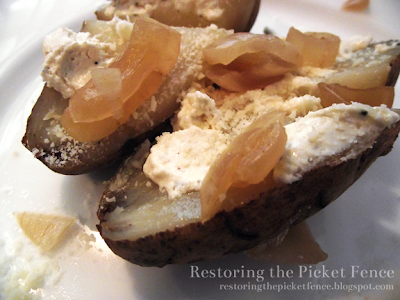 I added sliced onion with the raw potatoes this time -- yum! Step two: Put in slow cooker on high for four hours, or low for eight hours. Potatoes are pretty forgiving if you have to go longer. Hanging out in their sauna. See how golden the onions got? These are awesome to prepare on Saturday night. Just plug them in on Sunday morning and you have baked potatoes when you come home from church!